Team PokerStars Pros Liv Boeree and Igor Kurganov, the poker world’s most famous couple, teamed up for the WSOP $10,000 Tag Team Event. The pair took home top prize of $273,964 and a WSOP gold bracelet each. The first-time bracelet winners will be donating half of their winnings to Raising for Effective Giving (REG), the non-profit organisation they co-founded to promote a new way of thinking about charity. Team PokerStars Pro Bertrand ‘ElkY’ Grospellier was the runner-up in the WSOP $111K High Roller for One Drop taking home $2,278,657 which is ElkY’s largest live event cash of recent years. ElkY finished runner-up to Doug Polk. Guaranteed total prize pool for PokerStars Festival Marbella Main Event which is running June 21-25. PokerStars Festival Marbella is taking place at Casino Marbella June 19-25, 2017. The Player of the Series for SCOOP 2017 was João ‘Naza11’ Vieira from Portugal. Vieira reached seven final tables and earned 54 cashes and will now take home the additional $20,000 in prize money and the SCOOP trophy. Well known Swede Viktor ‘Isildur1’ Blom finished as runner-up on the low leader board. Episode number of this week’s Poker in the Ears Podcast, which is now available to stream or download. Brad Willis from PokerStars Blog talks about his early days covering live tournaments, the growth of the Blog, and recounts some fantastic Vegas stories. The number of days until PokerStars Championship Barcelona kicks off on August 15. PokerStars is hosting a series of special offers aiming to send players to Barcelona from now until July 5 including; Road to Barcelona Spin & Go 2X Challenges, Ultra Satellites, €10 Spin & Go’s, Daily Cash Challenges and Ticket Drops. 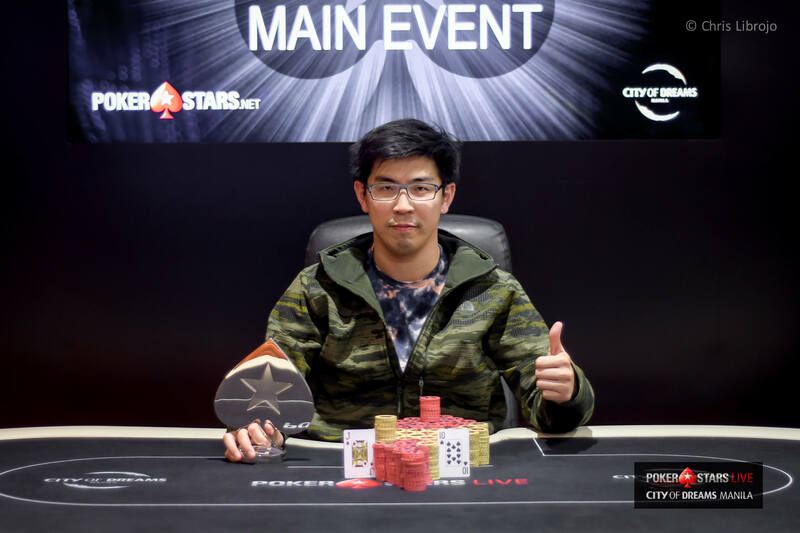 Taiwan's Po-yi Wu defeated Canada's Linh Tran to win his first major tournament title at Manila Megastack 7 after an epic back-and-forth heads-up battle that took 26 hands to play out. Team PokerStars Pro Online Lex Veldhuis from the Netherlands had a successful day on Monday winning two tournaments. Veldhuis first won the $82 Bounty Builder with a King-high straight as his winning hand, taking home $3,067.70 plus the $3,333.50 bounty award that included $1,685.47 for winning his own bounty.